Pack ice fills Conche Harbour on the Great Northern Peninsula in Newfoundland Labrador, Canada making it impossible for fisherman to go about their daily business. 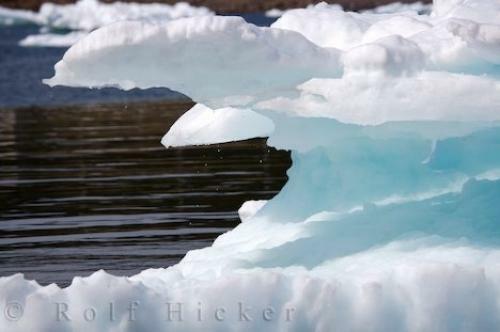 Photo of the pack ice slowly melting as it blocks the harbour of Conche on the French Shore of Newfoundland, Canada. Pictures from photo gallery "Newfoundland Pictures"
This picture is part of the photo album "Newfoundland Pictures" - there are more beautiful images waiting for you. ... The town of Conche in Newfoundland Labrador is a very interesting place to visit and explore the history of this unique village. You can spend days sitting along the shores of the harbour in the late spring and early summer and watch the pack ice change shape daily. Whales are regular visitors to Conche harbour and there is a fairly large amount of seals that live in and along the banks of the harbour.Pack Ice in Conche Harbour, Conche, French Shore, Northern Peninsula, Great Northern Peninsula, Viking Trail, Newfoundland, Canada. Make sure to see all our pictures of ice. I photographed this photo with the digital SLR camera model Canon EOS-1Ds Mark II, aperture of f/6.3, exposure time of 1/500 sec. on ISO 100, as always I used a original Canon Lens, the focus lenght for this picture was 235mm.